I’m a little obsessed with Downton Abbey right now. I watched the first season over Christmas and have been impatiently waiting for the weekly showings of the season two episodes. Sometimes a week is a very long time to wait. In case you haven’t yet found Downton Abbey, skedaddle. You can find the first season on Netflix; the second season is showing on PBS. The first season begins with the sinking of the Titanic and examines the laws of inheritance and the reinforcement of societal striations–lots of “our people” and “not our people” conversations. There is some talk about women’s suffrage, and a bit of talk about governmental policies, but it’s mainly about the personal dramas in Downton. The first half of season two, though, broadens the focus a bit–it is all about England’s involvement in World War I; these suggestions for further reading reflect that emphasis. Anyway, if you’ve already made it through all of the available Downton Abbey episodes, these will help tide you over. Of course, start with A Very Long Engagement. Sebastian Japrisot tells the story of Mathilde, a young French woman searching for her fiancé. Manech was one of five soldiers accused of cowardice in the trenches—although official sources report him dead, Mathilde believes he is still alive. In finding his story, she learns the stories of the other four soldiers—and each and every one is unforgettable. The book is great—and (shocking!) the movie is possibly even better. Both are quite, quite wonderful and very highly recommended. The story is wonderful. I absolutely loved the book. But just look at these pictures from the movie—so gorgeous. Audrey Tautou plays Mathilde, Gaspard Ulliel plays Manech, Marion Cottilard is one of the other soldiers’ sweethearts, and Jodie Foster is a soldiers’ wife. The movie was directed by Jean-Pierre Jeunet (director of Amelie); several actors are in both films. 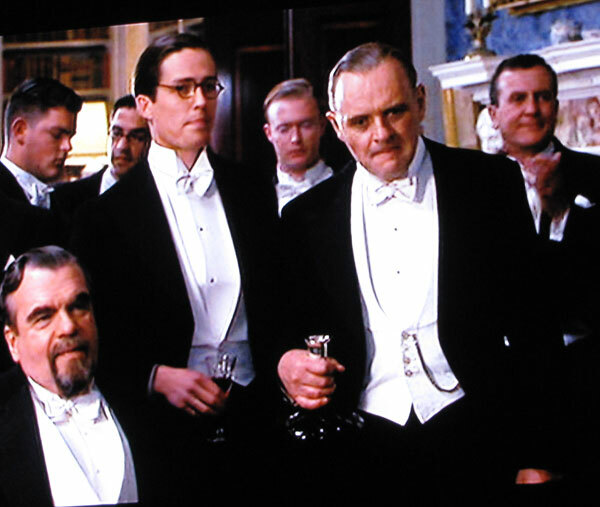 Stevens, a pre-war butler in post-war England, considers his life in service while trying to recruit a new housekeeper. Nearly his every thought–which we know, because the book is in first person—is focused on perfecting himself as a butler, of the dignity that is required, of the nobility of purpose, of the necessity of serving the right individual. But although he tries to keep himself focused on these self-improving thoughts, invariably he keeps returning to his memories of the one personal relationship in his long life—that time that Miss Kenton was the housekeeper at Darlington Hall. It’s a wonderful book. 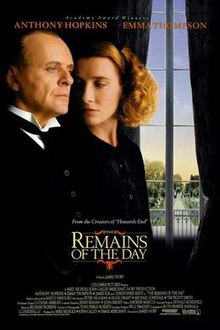 And in 1993, a film version of the book was produced starring Anthony Hopkins as Stevens and Emma Thompson as Miss Kenton. So, so good. And you really must read this blog post about the reality of servant’s quarters in the nineteenth century, complete with floor plans and interior diagrams. Fascinating. Interested in some more World War I stuff? I knew you would be. Anne Perry’s series of World War I novels is great. I’ve already talked about it at length, here, so if you want a little trench-flavored (ew) conspiracy, check them out. Speaking of trench-flavored, I’ve been reading Eye-deep in Hell: Trench Warfare in World War I, by John Ellis. Definitely not for the weak-stomached—holy mother, is it gross (rats, and lice, and maggots, oh my! )—but incredibly fascinating. Ellis talks about everything from supply lines to trench foot to the average weight that a soldier carried around with him. And check out this website, full of music from the era. A very old recording of the song Mary was singing when Matthew returned from the front (“If You Were the Only Girl in the World”) is on there, as well as many others. This site has some fascinating information about the medical practices on the front lines. And did you know more people died of Spanish Influenza just after the war than died in the war? I had no idea. Read more about it here. And that might be just about enough to keep you occupied until next Sunday night! Nancy was one of thousands of Americans holidaying on the continent during that last summer before the war: the Vanderbilts (Frederick and Louise); Nicholas Butler,the president of Columbia University; and “an estimated thirty thousand midwestern schoolteachers” taking guided tours of the places about which they taught were all caught unawares and unprepared for the European conflict. Letters of credit—many which drew on vast fortunes—were denied by banks stockpiling gold, trains were commandeered by the army, sailing schedules were cancelled. As the open boarders of the nations were slammed shut, thousands of wealthy Americans swarmed the U. S. Counsel, demanding to be taken care of. To deal with the situation that they so unexpectedly found themselves in, four American businessmen trapped in Europe chartered a ship, the Principe di Udine, and sent a few of the wealthy Americans home, Nancy (and all twenty-seven pieces of luggage) included. Much of my opinion about the events this book seems to be about what/who wasn’t included. The book doesn’t actually state that the less-advantaged American travelers in Europe were neglected, but there were certainly a lot of people left standing on the dock when the Principe pulled out. “Though the little ship could pack over a thousand people in its steerage, the committee realized that the American refugees, many traveling with a great deal of baggage, expected much better accommodations.” If that doesn’t make you see red (ha), I don’t know what will. Of course, just in the way the book was written—the inclusion of the information, however slight, about the other travelers in Europe–obviously provides a space for this type of frustration with the inequalities of the modern world. So kudos to the author for stitching their story so firmly into the weft and weave of this one. I was much more interested in the background story—that of the people who managed to take care of all of these entitled people—than the story of the entitled people. And I want to read the story of those thirty thousand school teachers! Anyway, the book only very obliquely address the economic disparity of the modern world. It’s mostly about Miss Nancy Johnson, debutante daughter of the senator, and her escape from Europe. Honestly, I was so expecting some grand trek over the Alps or hidden in a boxcar or something—this is what happens when you only read fiction!—that I was a little surprised when her path was so smooth. She is coddled, from the moment she initially lands in Europe to the moment she is shuffled back on board another ship, by men who fear the temper and power of her father. But she makes it out alive. And that’s important. The book was well written—could have been a done a little better (why do biographies always start with the birth? Give me a bang-up intro—tell me why I’m reading this book—then skip back to where her people come from.) and I actually enjoyed it quite a bit more than I’m expressing in this review. Yes, the assumption of privilege made my blood boil. But the experiences of the privileged are a legitimate part of our history and our world, as are the experiences of the thirty thousand school teachers. Beyond giving me quite a good view of the early days World War I (which I need, as I’ve yet to make it beyond the fourth page of Tuchman’s Guns of August) it gave me several ideas for future research into the plight of the not-so-privileged. And from the horror abroad, I moved on to horror a little closer to home. 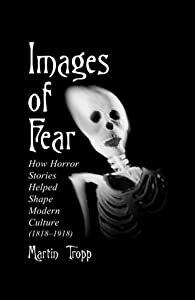 Martin Tropp’s Images of Fear: How Horror Stories Helped Shape Modern Culture (1818-1918) is proving a fantastic read. His argument is that the most enduring images of fear (Dracula, Frankenstein, Mr. Hyde) gave “form and meaning to the frightening events that have come to mark modern culture.” You can see from the dates included in the subtitle just what frightening events he refers to—from the beginning of the Industrial age (fears of machines), to the urbanization of the country (poverty, contamination and over-population of major cities); to Jack the Ripper and the Great War—he argues that the popular conception of these real nightmares was framed and formed by these modern myths. He quotes biologist Peter Medawar in his introduction:” We cannot make sense of the world around us without some structure which gives it meaning—there is no such thing as pure observation.” Tropp argues that the structure that allowed people in the nineteenth and early twentieth century to understand the huge changes in their world was literature—and specifically, horror literature. I absolutely love how this book connects my two major interests right now—the Victorian Gothic and World War I. I’m not sure if this will prove immediately useful (beyond the absolutely fascinating chapter on Northanger Abbey, which I’m using for my independent study), but it’s definitely going in the file! And that’s what has been occupying my time this week. Anybody read something fabulous lately? I love book suggestions!